This article is about the tool. For other uses, see Hammer (disambiguation). The modern hammer head is typically made of steel which has been heat treated for hardness, and the handle (also called a haft or helve) is typically made of wood or plastic. The term "hammer" also applies to a mechanism's part that delivers a blow, such as the hammer of a firearm or of a piano. The claw hammer has a "claw" to pull nails out of wood, and is commonly found in an inventory of household tools in North America. Other types of hammer vary in shape, size, and structure, depending on their purposes. Hammers used in many trades include sledgehammers, mallets, and ball-peen hammers. Although most hammers are hand tools, powered hammers, such as steam hammers and trip hammers, are used to deliver forces beyond the capacity of the human arm. There are over 40 different types of hammers that have many different types of uses. The use of simple hammers dates to around 3.3 million years ago according to the 2012 find made by Sonia Harmand and Jason Lewis of Stony Brook University, who while excavating a site near Kenya's Lake Turkana discovered a very large deposit of various shaped stones including those used to strike wood, bone, or other stones to break them apart and shape them. The first hammers were without handles. <https://langs.co.uk/blog/2017/06/30/the-history-of-the-hammer-from-its-prehistoric-beginnings/> Later stones attached to sticks with strips of leather or animal sinew were being used as hammers with handles by about 30,000 BCE during the middle of the Paleolithic Stone Age. The addition of a handle gave the user better control abilities and less accidents. <https://langs.co.uk/blog/2017/06/30/the-history-of-the-hammer-from-its-prehistoric-beginnings/>. The hammer became the number one tool. Used for building, food and protection. The hammer's archeological record shows that it may be the oldest tool for which definite evidence exists of its early existence. A traditional hand-held hammer consists of a separate head and a handle, which can be fastened together by means of a special wedge made for the purpose, or by glue, or both. This two-piece design is often used to combine a dense metallic striking head with a non-metallic mechanical-shock-absorbing handle (to reduce user fatigue from repeated strikes). If wood is used for the handle, it is often hickory or ash, which are tough and long-lasting materials that can dissipate shock waves from the hammer head. Rigid fiberglass resin may be used for the handle; this material does not absorb water or decay but does not dissipate shock as well as wood. A loose hammer head is hazardous because it can literally "fly off the handle" when in use, becoming a dangerous uncontrolled missile. Wooden handles can often be replaced when worn or damaged; specialized kits are available covering a range of handle sizes and designs, plus special wedges for attachment. Some hammers are one-piece designs made mostly of a single material. A one-piece metallic hammer may optionally have its handle coated or wrapped in a resilient material such as rubber, for improved grip and to reduce user fatigue. The hammer head may be surfaced with a variety of materials including brass, bronze, wood, plastic, rubber, or leather. Some hammers have interchangeable striking surfaces, which can be selected as needed or replaced when worn out. A large hammer-like tool is a maul (sometimes called a "beetle"), a wood- or rubber-headed hammer is a mallet, and a hammer-like tool with a cutting blade is usually called a hatchet. The essential part of a hammer is the head, a compact solid mass that is able to deliver a blow to the intended target without itself deforming. The impacting surface of the tool is usually flat or slightly rounded; the opposite end of the impacting mass may have a ball shape, as in the ball-peen hammer. 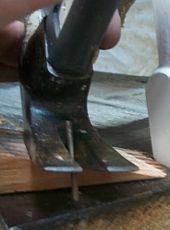 Some upholstery hammers have a magnetized face, to pick up tacks. In the hatchet, the flat hammer head may be secondary to the cutting edge of the tool. The impact between steel hammer heads and the objects being hit can create sparks, which may ignite flammable or explosive gases. These are a hazard in some industries such as underground coal mining (due to the presence of methane gas), or in other hazardous environments such as petroleum refineries and chemical plants. In these environments, a variety of non-sparking metal tools are used, primarily made of aluminium or beryllium copper. In recent years, the handles have been made of durable plastic or rubber, though wood is still widely used because of its shock-absorbing qualities and repair-ability. Cross-peen hammer, having one round face and one wedge-peen face. Drilling hammer – a short handled sledgehammer originally used for drilling in rock with a chisel. The name usually refers to a hammer with a 2-to-4-pound (0.91 to 1.81 kg) head and a 10-inch (250 mm) handle, also called a "single-jack" hammer because it was used by one person drilling, holding the chisel in one hand and the hammer in the other. In modern usage, the term is mostly interchangeable with "engineer's hammer", although it can indicate a version with a slightly shorter handle. Engineer's hammer, a short-handled hammer, was originally an essential components of a railroad engineer's toolkit for working on steam locomotives. Typical weight is 2–4 lbs (0.9–1.8 kg) with a 12–14 inch (30–35 cm) handle. Originally these were often cross-peen hammers, with one round face and one wedge-peen face, but in modern usage the term primarily refers to hammers with two round faces. Rounding hammer, Blacksmith or farrier hammer. Round face generally for moving or drawing metal and flat for "planishing" or smoothing out the surface marks. In professional framing carpentry, the manual hammer has almost been completely replaced by the nail gun. In professional upholstery, its chief competitor is the staple gun. Woodsplitting maul – can be hit with a sledgehammer for splitting wood. Woodsplitting wedge – hit with a sledgehammer for splitting wood. In the swing that precedes each blow, the hammer head stores a certain amount of kinetic energy—equal to the length D of the swing times the force f produced by the muscles of the arm and by gravity. When the hammer strikes, the head is stopped by an opposite force coming from the target, equal and opposite to the force applied by the head to the target. If the target is a hard and heavy object, or if it is resting on some sort of anvil, the head can travel only a very short distance d before stopping. Since the stopping force F times that distance must be equal to the head's kinetic energy, it follows that F is much greater than the original driving force f—roughly, by a factor D/d. In this way, great strength is not needed to produce a force strong enough to bend steel, or crack the hardest stone.
. While the energy delivered to the target increases linearly with mass, it increases quadratically with the speed (see the effect of the handle, below). High tech titanium heads are lighter and allow for longer handles, thus increasing velocity and delivering the same energy with less arm fatigue than that of a heavier steel head hammer. A titanium head has about 3% recoil energy and can result in greater efficiency and less fatigue when compared to a steel head with up to 30% recoil. Dead blow hammers use special rubber or steel shot to absorb recoil energy, rather than bouncing the hammer head after impact. The handle of the hammer helps in several ways. It keeps the user's hands away from the point of impact. It provides a broad area that is better-suited for gripping by the hand. Most importantly, it allows the user to maximize the speed of the head on each blow. The primary constraint on additional handle length is the lack of space to swing the hammer. This is why sledgehammers, largely used in open spaces, can have handles that are much longer than a standard carpenter's hammer. The second most important constraint is more subtle. Even without considering the effects of fatigue, the longer the handle, the harder it is to guide the head of the hammer to its target at full speed. Most designs are a compromise between practicality and energy efficiency. With too long a handle, the hammer is inefficient because it delivers force to the wrong place, off-target. With too short a handle, the hammer is inefficient because it doesn't deliver enough force, requiring more blows to complete a given task. Modifications have also been made with respect to the effect of the hammer on the user. Handles made of shock-absorbing materials or varying angles attempt to make it easier for the user to continue to wield this age-old device, even as nail guns and other powered drivers encroach on its traditional field of use. As hammers must be used in many circumstances, where the position of the person using them cannot be taken for granted, trade-offs are made for the sake of practicality. In areas where one has plenty of room, a long handle with a heavy head (like a sledgehammer) can deliver the maximum amount of energy to the target. It is not practical to use such a large hammer for all tasks, however, and thus the overall design has been modified repeatedly to achieve the optimum utility in a wide variety of situations. Gravity exerts a force on the hammer head. If hammering downwards, gravity increases the acceleration during the hammer stroke and increases the energy delivered with each blow. If hammering upwards, gravity reduces the acceleration during the hammer stroke and therefore reduces the energy delivered with each blow. Some hammering methods, such as traditional mechanical pile drivers, rely entirely on gravity for acceleration on the down stroke. A hammer may cause significant injury if it strikes the body. Both manual and powered hammers can cause peripheral neuropathy or a variety of other ailments when used improperly. Awkward handles can cause repetitive stress injury (RSI) to hand and arm joints, and uncontrolled shock waves from repeated impacts can injure nerves and the skeleton. Additionally, striking metal objects with a hammer may produce small metallic projectiles which can become lodged in the eye. It is therefore recommended to wear safety glasses. A war hammer is a late medieval weapon of war intended for close combat action. The hammer, being one of the most used tools by Homo sapiens, has been used very much in symbols such as flags and heraldry. In the Middle Ages, it was used often in blacksmith guild logos, as well as in many family symbols. The hammer and pick are used as a symbol of mining. A well-known symbol with a hammer in it is the Hammer and Sickle, which was the symbol of the former Soviet Union and is strongly linked to communism and early socialism. Mythology includes hammers for their Gods. Thor, Hercules and Sucello all had hammers that appear in their lore and carried different meanings. The hammer in this symbol represents the industrial working class (and the sickle represents the agricultural working class). The hammer is used in some coat of arms in (former) socialist countries like East Germany. Similarly, the Hammer and Sword symbolizes Strasserism, a strand of National Socialism seeking to appeal to the working class. The gavel, a small wooden mallet, is used to symbolize a mandate to preside over a meeting or judicial proceeding, and a graphic image of one is used as a symbol of legislative or judicial decision-making authority. In Norse mythology, Thor, the god of thunder and lightning, wields a hammer named Mjölnir. Many artifacts of decorative hammers have been found, leading modern practitioners of this religion to often wear reproductions as a sign of their faith. In American folklore, the hammer of John Henry represents the strength and endurance of a man. The hammer in the song "If I Had a Hammer" represents a relentless message of justice broadcast across the land. The song became a symbol of the civil rights movement. ^ "hammer Meaning in the Cambridge English Dictionary". dictionary.cambridge.org. Retrieved 9 June 2018. ^ "How hammer is made - material, making, history, used, components, structure, steps". www.madehow.com. Retrieved 21 August 2018. ^ Akins, Ricky (6 September 2018). "40 Different Types of Hammers and Their Uses". Garage tool advisor. Retrieved 29 October 2018. ^ a b Kate Wong (15 April 2015). "Archaeologists Take Wrong Turn, Find World's Oldest Stone Tools". Scientific American. Retrieved 18 April 2015. ^ "What are some suitable woods to use for tool handles?". woodworking.stackexchange.com. ^ "How hammer is made - material, making, history, used, components, structure, steps". www.madehow.com. Retrieved 20 August 2018. ^ "A beginner's guide to hammers". 6 August 2014. ^ "Slaughter of livestock". FAO Corporate Document Repository. Food and Agriculture Organization of the United Nations. Retrieved 10 July 2015. ^ "Tools for Pounding and Hammering". Retrieved 3 August 2014. ^ Fish Ensie, E. (February 1909). "Handling Locomotive Supplies, Part III.--Standardization". American Engineer and Railway Journal: 55. Retrieved 3 August 2013. ^ Cage, Chuck (15 June 2011). "DeWalt's Titanium Hammer Killer?". Toolmonger. Retrieved 18 April 2013. Wikimedia Commons has media related to Hammers. Look up hammer in Wiktionary, the free dictionary. "Choosing a Hammer". Popular Science, June 1960, pp. 164–167.